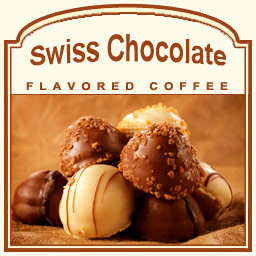 For a traditional chocolate coffee, look no further than the Swiss Chocolate flavored coffee. This 100% Arabica flavored coffee features nothing but creamy, silky chocolate flavors that will melt your taste buds into relaxation. Warm and sweet, this Swiss Chocolate flavored coffee will awaken your chocolate-loving senses with a decadence of pure milk chocolate. Perfect for the morning or evening, this full-bodied chocolate coffee will hit the spot with its smooth flavor and appetizing aroma. A heat-sealed valve bag will ensure the freshest coffee possible, which is why we roast and ship the Swiss Chocolate flavored coffee on the same day. This Swiss Chocolate coffee is a dreamy flavored treat for anyone that has a sweet tooth and loves chocolate. Let the sweet aroma hit you and you�ll be hooked on this one-of-a-kind chocolate coffee creation!